We are all used to receiving emails from Nigerian princes trying to flee an oppressive regime or winning an online lottery we never entered, both promising millions of dollars in money if we just provide our bank account information and our social security number. We learned to ignore them. The powers of numbers associated with the internet allow millions of emails to be sent out at relatively little cost, with the potential for big results in the form of your entire bank balance. But now a Lansing based company is trying the opposite approach. 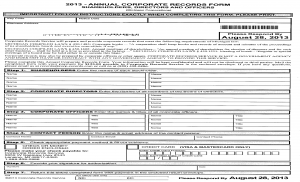 Send out thousands of forms by regular mail in hopes of getting just $125 each from unsuspecting victims; companies not paying too close attention to what appears to be just another state form. This is no less a scam so watch out. 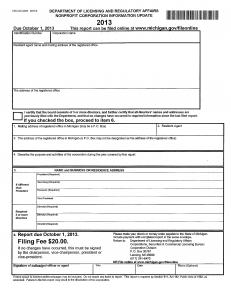 Below is an example of the fake form on the left and next to it is the official state form it seeks to emulate. Click HERE to go to the official press release from the State of Michigan in regards to this issue. When Times are Bad. . . or Good. We have all experienced the tough economic climate over the last couple of years. Nowhere has that been harder felt than here in Michigan where job losses have been reported to be as high as 1 in 5, of the job loss of the nation as a whole, over the last ten years. To put it in perspective, and this is obviously not the actual way the numbers panned out, for every one job the other 49 states lost (one job each) Michigan lost 9.8 jobs during that same period. Thankfully things seem to be on an uptick here with manufacturing picking up pace. As it turns out there are two times when business owners begin to squawk about how much or how little they are making. And it is these same two times where we see an uptick in corporate and shareholder disputes. When things aren’t going well people look at the bottom line and cringe. They look for ways to generate additional revenue; reviewing old outdated methods, revisiting tried and true methods of attracting new customers. They take out the red pen and begin to scratch out ways to cut costs; where have we spent more this year than in the past? Owners streamline systems and companies become leaner and meaner. Both of these methods of analysis: looking at the top line in generating revenue or the bottom line in looking for cost cutting often end up in the same place: other owners compensation. “You know Fred doesn’t generate the kind of revenue he used to. But he still gets paid the same amount. We would be better off without him.” Is a common sentiment in tough economic times. As a business attorney, I promise, this is not the time to ponder “You know we really should take a look at that buy/sell agreement we’ve talked about.” The time to agree on the business divorce is at the time of the business marriage, when everyone is sure things will never fall apart. Pretty intuitive stuff. Strangely though the opposite (which seems some what counter intuitive) is also true. Often when things are going swimmingly owners contemplate their partners in the same way. They have the money to fight and they decide that “I am more important to the business than you.” They look at what they are making and then ponder. “You know I am making a ton of money and if I dumped Fred, I could replace him for a fraction of what he is getting, and I would have 2 tons of cash.” Typically it’s more PC than that, Fred’s done something or there is an event or mistake. It’s not a conscious thing like I have just laid out. But the result is the same. Dump Fred. Need I say it again? As a business lawyer, this is not the time to start thinking about how to orchestrate a buy out. It’s too late. You will rarely get cooperation from Fred on this bombshell and since both sides have the dough to duke it out. They usually do. Which is great for the business attorneys involved, well maybe the litigator, but it’s not great for the business, nor the business owners, nor their families. So I suppose this amounts to a shameless plug for you to get ahold of a business attorney and get your buy/sell done, more that, say, a blog article. In keeping with that then: get your buy/sell done.